Red Tulip tapestry shows a pair of deep red tulips in superb detail. In this work, which is illustrative in style, is both a botanical study as well as a work of art in itself. Such was the tradition of 18th and 19th century botanists who studied the beauty of flowers and blooms, both scientifically as well as to celebrate its beauty as an art form. Here the light shows the petals of the rich red tulips and green foliage very well. A lovely red border completes the work. 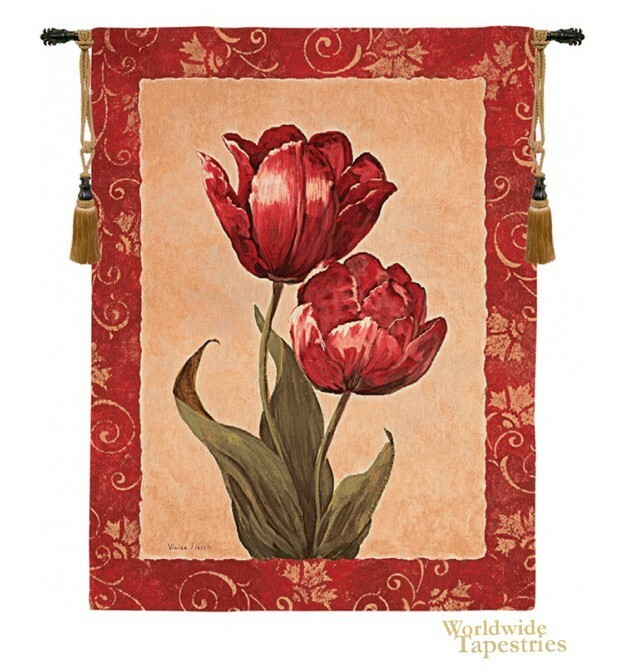 Red Tulip tapestry is backed with lining and tunnel for easy hanging. Note: tapestry rod and tassels, where pictured, are purchased separately.